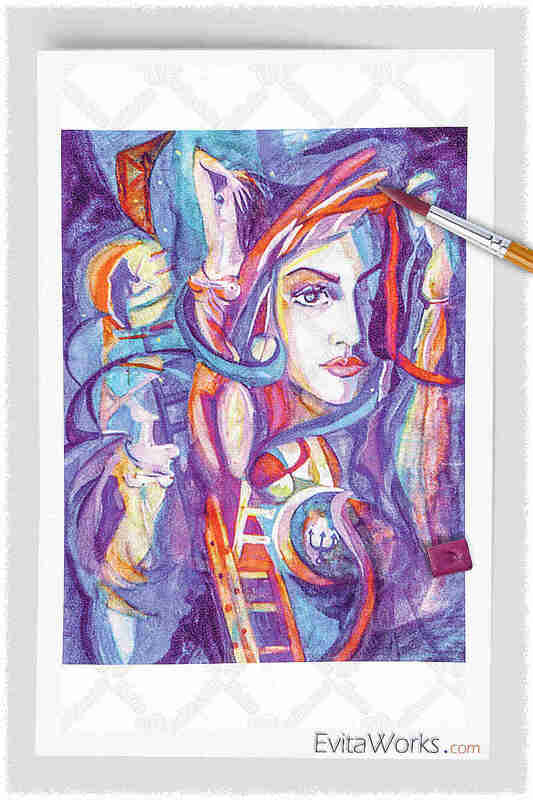 This item is based on our original painting, named “Immersing Self”. Add review for this work ? Gorgeous print with vibrant colours. I love it! Thank you for the mini print too! Gorgeous work, looks like you really knew what you been doing. I like that every detail on this picture has double meaning, and slowly transfers to something else. My eyes are running from one end to another, so there are so many things to see here. Beautiful piece. This piece succeeds on many levels. The composition, texture, and palette work well together. The sense of a strong light source is really effective. The fantastical element of implied symbolic relationship between the bird and figure is very intriguing. Nice work! This piece caught my eye as the colors are vibrant and the suject matter is delightful ! Organization Any organization you represent? Website Do you have a website (blog, etc.)? What is your opinion about this artwork? If you've purchased already from us, please describe your experience. Thank you! You have successfully subscribed to the EvitaWorks Newsletter. Occasional updates only. Art for free with each issue. We won't share your e-mail with anyone. Cookies ensure the proper working of this website, and some statistics (GDPR-compliant) to help improve our services over time. Acceptance or further usage implies acknowledgement of this.